Are you looking for a dog trainer in Queens? Dogs in Queens and other city dogs have different challenges and goals than dogs in other, more rural areas. We can help! This is our original program. In "One on One" Basic Obedience, a dog trainer will work with you and teach you how to train your dog. At the end of this course, your dog will know Sit, Stay, Come, Heel, Down, Off, Leave it, and Place, both on leash and off leash. Your dog will follow all these commands during distractions and without food bribes. When in heel (walk next to me) your dog will happily pay attention. For dogs that display undesirable behaviors in the home (counter surfing, running out the door, trying to eat the neighbor's cat) this program is the way to go. This is a two-week dog obedience boarding program that is followed up with private lessons in your home. Over the years, this program has exploded in popularity and is our most referred program from existing clients to their friends and family. Most people who choose Board and Train either have little time to train their dog, are going away on vacation, are pregnant, or their dog is physically stronger then they are. Although the owners still need to maintain training, this program requires less effort than the "At Home" program. Here's how it works. Your dog will come and stay with us for two weeks. At the end of this phase your dog will know all the basic commands (Sit, Stay, Come, Heel, Down, Off, Leave it, and Place) both on leash and off leash. The dog will be trained 2-3 times every day, in the home, outside, near shopping centers, around other dogs, squirrels, people, cars, etc. We introduce the dog to as many different circumstances as possible. Between training sessions, your dog will have playtime, snacks, and walks. When the dog returns home, a trainer will give you the first follow up lesson in your home. Best Friend's Dog Training insists on the follow up training sessions to make the training long lasting and effective so the owners understand what to do. These popular training methods include a "Lifetime" membership to the Best Friend's Dog Training Community. The "Lifetime" membership is for the life of your dog and provides unlimited follow-up group classes, annual picnics and parties for dogs, as well as receiving a discount on boarding. Come to our Group Dog Training Class in Queens! Whether you are a client or just want to see how we work, come visit our group class in Queens. We meet Tuesday Evenings at Rockapup, 7 pm. We get calls all the time from people who said their dog had "failed" obedience school. The problem usually is not the dog but what the other school failed to successfully teach the owner. This is a shame and a waste of money. Best Friend's Dog Training understands that telling someone to "do this" is not good enough. You need to understand why you are doing something.We know it takes some people longer then others to understand what is being taught. That's why we offer One Price for the Life of the Dog. We give free evaluations so you can ask us all the questions you want and there are no surprises. When you work with Best Friend's Dog Training, you will never hit or yell at your dog. All attention getting techniques are done at very low levels and copious amounts of praise and love will be used to reinforce wanted behavior. 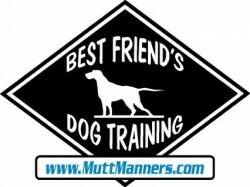 Unlike other trainers, Best Friend's Dog Training offers a team of trainers! What does that mean for you? No matter what your schedule or availability, we have a trainer that can work with you. Learn more about our staff. This is a 6 week dog training class with leash based instruction. Participants can choose to use any leash training tools like slip, prong, or martingale collars. With any of the tools people choose, dogs will learn using non-punishment techniques. Food is welcomed as a positive supplement but this is NOT a food only class. The cost for this class is $299. Classes will resume in Rockaway Park in the Fall. Breakfast with a few Best Friend's Dogs (and owners) on July 11th, Wantagh NY. Notice the untouched eggs, bacon, and french toast on plates in front of the dogs. Rockaway Park, Rockaway Beach, Breezy Point, Queens South, Bayside, Bay Terrace, Flushing, Forest Hills, Kew Gardens, Woodside, Maspeth, Glendale, Ridgewood, Howard Beach, Whitestone, Douglaston, Belle Harbor, College Point, and more. Just call and ask!